DR. PERKINS STANDS next to her car with her medical bag after arriving in the Helderberg Mountains in 1928. By the mid-1930s, her daily house call practice encompassed 200 square miles. “A Good and Noble Thing" is available at the Book House of Stuyvesant Plaza in Albany, Kelly's Pharmacy in Greenville and the Rensselaerville Library, or by emailing fininj@gmail.com. As her youth continued, she quickly became accustomed to being “presented at a tea,” wearing “a russet gown in shades of brown, red and yellow” as a bridal attendant, and coming out as a debutante draped in silk. The Catholic girl who was born in 1899 could trace her lineage to Benjamin Franklin and Charles Carroll, but it seemed that Perkins was born to do little more than spend money on finery and fetes. Then she made a major shift in her life as she grew and decided to become a physician at a time when very few women were doctors. Her glamour gowns were replaced by surgical gowns, and her fancy furs were supplanted by plain coats for traveling around Rensselaerville in southern Albany County, where she cared for residents for 65 years. In her obituary in 1993, The New York Times reported that she had charged the same fees for more than quarter of a century: $4 for an office visit and $5 for a home visit. 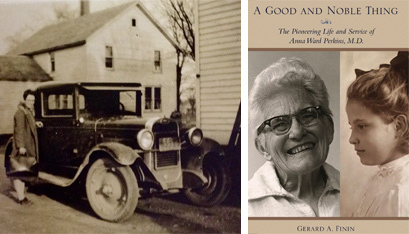 Such a fascinating woman merits a biography, and one has just been published: “A Good and Noble Thing: The Pioneering Life and Service of Anna Ward Perkins, MD.” Gerard Finin, the author, is not only a native of Rensselaerville, but also a former patient of the physician. While that didn’t happen, he did discover 60-some letters she wrote during the First World War to her grandparents in Boston. “These were all put to good use,” the author said. What led the physician from Boston to rural Albany County “involved several considerations,” the author continued. “She wanted to go to a place where she was needed, and the Helderberg Mountains very much needed physicians. In his book, Mr. Finin remarks on “the intensity of Anna’s religious devotion” at Mass at her parish, St. John’s in Greenville. Also quoted in the book is Rev. Christopher DeGiovine, a priest of the Albany Diocese who is currently pastor of St. Matthew’s parish in Voorheesville. “Dr. Perkins’ bedrock Catholic spirituality was largely responsible for the life of service that she lived,” Mr. Finin said.